The Facebook Group Page was created by Joe Ellis in memory of Ramsgate’s Janet Yates, his aunt, who sadly passed recently. 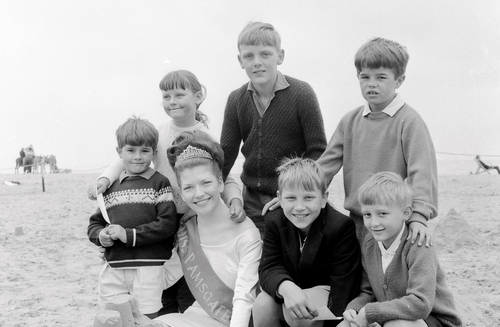 Janet was proud to represent her beloved town as Miss Ramsgate, in 1965. She was a beautiful lady, well respected, and much-loved wife of Lionel, mother to Lucy and Chris, and grandmother. She is missed terribly by all her family and friends, and her memory will be kept alive by this Group, as well as a website and Twitter feed chronicling the past and present Ramsgate. Ellis said: ‘As someone who has lots of family in Ramsgate including my mother and late father’s family, I was part of another Facebook group about Ramsgate, but the vibe was very negative and gossipy. Most of the postings involved moans about shops closing, dog poo on pavements, and whether the neighbours had played loud music at night! My interest is in the history, the architecture… a complaint about my constant postings of historical events, triggered this new page to be formed in my aunt’s honour’. Within just three days, the page had achieved over eight hundred members. Ellis has other successful social media specialist pages; he has a passion for anything online, social media and information technology. He was diagnosed with Asperger’s Syndrome some nine years ago and attributes this passion to his autism. Dr Sandra Beale-Ellis, Joe’s wife, also diagnosed Asperger’s, as well as having a doctorate in education (autism) said: It is recognised that many autistic individuals enjoy and understand computer-based programmes and initiatives for many reasons, not least as it is a more comfortable way to interact with friends, family and new people. For Joe, anything IT is his way to relax. Together with a love of history, creating these specialist Facebook pages is an ideal outlet for him. He also has incredible pages dedicated to Bethnal Green and East London (his birth place), Ashford (where he spent his later childhood and teens), and Simon and Garfunkel (his idols). He is very talented in this area; he runs many business sites including my own as well. The We Love Old Ramsgate page is gaining momentum quickly; members are positively interacting with the postings of photographs, videos and press clippings from historical archives, reminiscing and chatting about the old and newer times in their town. A recent photograph post of Ramsgate’s famous resident ‘ITV Vera’s Brenda Blethyn, has created a great stir among many residents and former residents, who were at St Augustines School with Blethyn (then Bottle) and have been chatting about their school days. Other famous faces who lived or worked in Ramsgate include Edward Heath who went to Chatham House Grammar School, John Le Mesurier who is buried in St Georges Church, Vincent van Gough who was a supply teacher in the town in 1876, and even Queen Victoria, who as a princess holidayed in Towley House, now J C Farleys Ltd, a furniture store. Joe is a full time professional karate instructor, holding a 7th Dan black belt and is of international repute. This press release was distributed by ResponseSource Press Release Wire on behalf of NAKMAS in the following categories: Men's Interest, Entertainment & Arts, Leisure & Hobbies, Home & Garden, Women's Interest & Beauty, Environment & Nature, Sport, Education & Human Resources, Retail & Fashion, Public Sector, Third Sector & Legal, for more information visit https://pressreleasewire.responsesource.com/about.